Dunster, Exmoor and The Quantocks - an area full of natural beauty, picturesque villages, beaches and rugged coastline. Wake to the sound of chattering reed warblers or the puffing of a nearby steam train. The Duck Chalet is the perfect setting for a relaxing traditional seaside holiday and is also an excellent base from which to explore the surrounding scenic countryside and coastline by foot, cycle, steam train, bus or car. 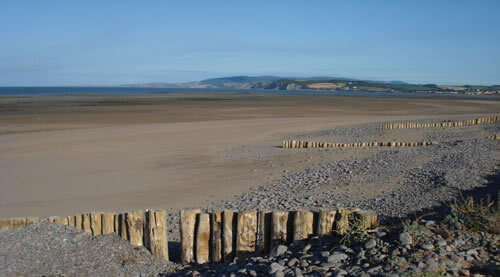 The self catering chalet is situated in a tranquil area of the well maintained Dunster Beach Chalet Park. It overlooks Hawn Lakes, a nature reserve and has views of Dunster Castle and the wooded slopes of Exmoor to the rear, and a few yards away to the front is Dunster Beach and the Bristol Channel. With no through road and a strict 10 mph speed limit, it is a safe place for children to play. The beach is sand and pebble with safe bathing.